Looks beautiful in my downstairs bathroom. Its great focal point. Had to modify the back alittle bit for the faucet, but it was well worth the price we paid for it. Great piece. Functional and beautiful, this 36-inch bathroom vanity set from Virtu USA is the perfect fit for a small bathroom. Store bathroom supplies in the large lower cabinet, and organize your toiletries in the four spacious drawers. The large counter top on this single-sink bathroom vanity set provides ample space for toothbrushes and other frequently used items. I ordered two of these to replace a really long outdated vanity in my hall bath and they are really nice. The value to getting the carerra marble top and backspash along with this vanity is outstanding. I could not get this deal anywhere else. They are somewhat lightweight, so my expectation of them being super durable is not high. However, for the location and the amount of use they will get, they are fine. Right now my daughter is using this bathroom and has tons of her stuff stored in the drawers, so she's in and out of them all the time and they are holding up just fine. This was one of the nicest vanities I found . Size,draw space,soft close draws everything, everything very nice. I opted for the off set sink ,as the vanity is up against the wall . So there is greater counter space on the left and has worked out well to place additional bath items. We installed this vanity in a small bathroom and the size and look was perfect. The provided sink did not have mounting hardware so we had to improvise a little and make something work from Home Depot. Other than that, the quality isn't there. One of the drawers continually comes off its tracks and is a pain to get it back on there. This would be good for a guest bathroom that doesn't get used often but I would not buy for a master bath. I am very impressed with this product. It is definitely worth the money. Such better quality than some others I have seen. There was a small hole in the outer box but as it was a solid packaged item, there was no damage to any of the actual product. The stone vanity top is superb and complements our marble shower tile well! The only negative (minor) is the top drawer directly under sink does not open (fake drawer) which I can understand. Great value for the price point - was looking at a similar stye vanity from Kohler for $1k extra! Beautiful well made cabinet but first sink to small and second sink to large but both overstock and the manufacturer worked to make it right. Plumber mad at the difficult and trying time for install. Be aware that this does not come with sink or counter installed. All in separate boxes. Same price as vanity all put together. Buyer beware. The vanity came well packaged with no issues--the mirror, the vanity top and the console are all packaged separately. It was easy to assemble, but I am disappointed with the quality of the marble top. To increase the depth of the top, two different pieces of the marble are glued together to make it thicker. It looks stupid. I like the vanity, so I will find a remnant and replace the marble top. It is a very dark espresso, almost black, but it's not black. The color is as expected - espresso/very dark brown. Marble is beautiful. First sink opening was cut incorrectly but a replacement was sent out. Very pleased with this product! This unit is high quality for the price. The marble is beautiful and the color just what I wanted. Because of the wall and radiator in my 100 year old home, I really liked the option of having the drawers on the right. Love this unit however the back where the plumbing goes was too small and my plumber had to cut the shelf which made less room for my towels. Also the last draw does not stay on the tracts. I am hoping to see get that part return or fixed. very nice vanity, hardware and marble are very nice. I much prefer this over design elements. Pissed I used them for my master. I had to shave the door of one of the drawers since the sink kept hitting it and I did not install myself I had a plumber do it that is an accomplished plumber so he said this is what you get when you buy an on line product. too difficult to return and I needed the item so I was forced to modify it and use paint to touch up the drawer. It was not for my own house it was for a rental property but it should still be correct at this much money. "The color is listed as espresso but comes up in search as black. Can you confirm if color is dark brown or black?" The cabinet is finished in an espresso color. "How far over is the drain from the sink side of the cabinet? Hopefully it is in the 11 - 13 inch range." Hello Pat4715, we are still researching this and should have the answer shortly. Hello Pat4715, thank you for shopping with us. The drain from the left edge to drain center is 23.5 inches and from right edge to center is 12.5 inches. Have a nice day. "Being marble, is this likely to stain? It's for a kid's bathroom, and I'm concerned about how well it will hold up." Hello mshutterbug, thank you for shopping with us. The marble has been sealed but the manufacturer does recommend that you reseal it every 1-2 years. Have a great day. "Does changing the side the drawers are on also change the side the sink is on? Just want to be sure because it's not super clear." Hello mshutterbug, it does change the position of the sink as well. The plumbing will not fit properly with the drawers located under the sink. Please feel free to contact us again with any further questions. Thank you for shopping with us! "Hi. Just wondering if the draws are dove tail contruction?" 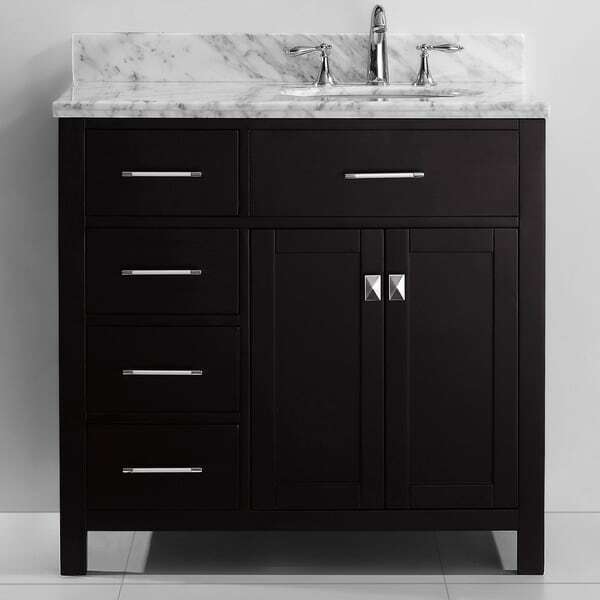 Hello Danny, the drawers in the Virtu USA Caroline Parkway 36-inch Single-sink Bathroom Vanity Set, are made with a doweled construction and are constructed in the overlay method. They are attached together with modern adhesives and hardware. Have a great day. "How many pieces of freight does this come shipped to me?" Hello Burna, this model will arrive on one pallet with 4 boxes. Thank you for shopping with us! "Does this package include the sink bowl?" Hello Mark W, this purchase includes the sink. Thanks for shopping with us!